Departing Ocean Village Marina this experience offers the chance to drive and navigate the cruiser out into Southampton water. Choose from a trip to the Needles, or maybe a jaunt over to Cowes with a stop of for a swim and sunbath in Osbourne Bay! A half day charter includes an optional break for lunch. 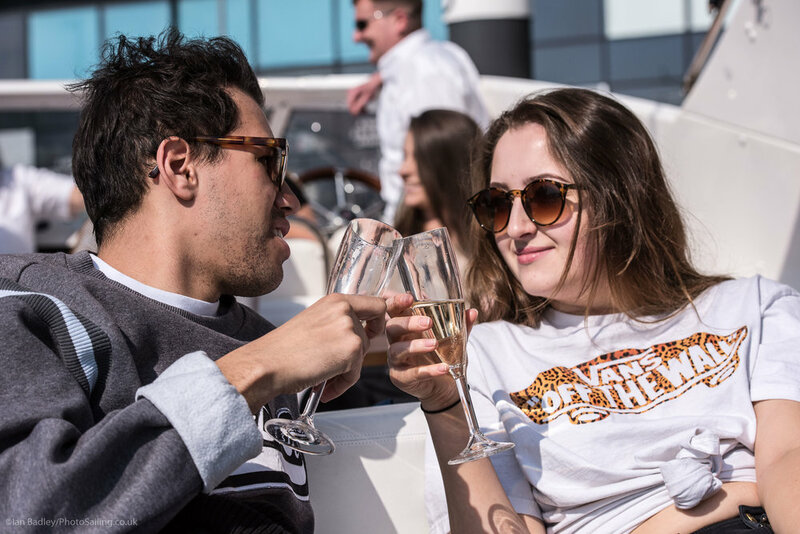 We can recommend some places for Lunch, or if you prefer you could bring your own picnic lunch and have it onboard! Prices include drinks on board, breakfast and lunch will be separate and be at your cost ashore. You are welcome to bring your own food or drink to consume on board. All bookings are subject to availability. Please make your booking at least 2 weeks in advance. A 25% non-refundable deposit is due on booking. The balance will be due two weeks before your event. All Experiences are weather dependent and any cancellations are for your own safety. 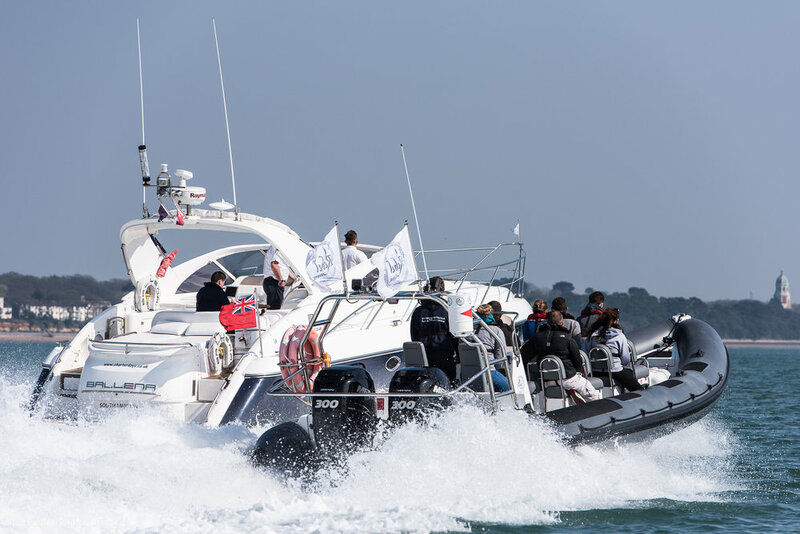 In the event of a cancellation, you will be contacted by the Skipper on the mobile number provided when you made your booking. 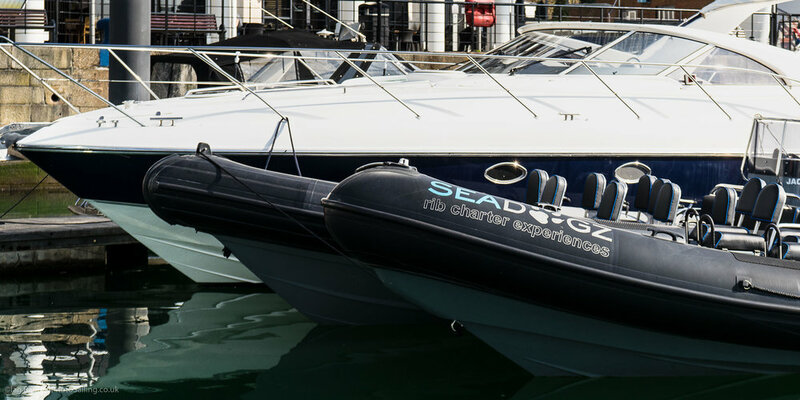 Seadogz will endeavour to re book you on the next available experience. All books have a 10 day cancellation period from the date that you are booked. If you need to move or cancel the booking and you are within the 10 days then you may still be charged. All Experiences include a safety brief and life jacket fitting. Please dress for the outdoors, warm clothes if it's cold, light, flat soled foot wear, trainers are ideal, a waterproof or windproof jacket is a good idea even if it's hot, also your sun tan lotion and sunglasses. Remember, bring a change of clothes for your return – you may get wet! Lifejackets and any necessary safety equipment will be issued on the day. Waterproofs can be hired at a price of £5 per person. You must be physically fit. Not suitable for pregnant ladies or people with bad backs or necks. Any medical conditions must be notified to the operator on booking. There are no formal height restrictions but in order to reach the floor whilst seated on the 'jockey seat' participants should have an inside leg measurement of 24 inches. Weight Limit: 18st. There are no qualifications required. The minimum age is 8 years- children must be able to hold themselves onto a jockey seat. Under 18's must be accompanied by an adult.